NYC Local Stop: How Did the Elephant Cross the Road? Q. How do you transport a troupe of circus elephants onto the island of Manhattan (when they are too big for a truck and all the trains into NYC are just passenger trains)? Ladies and gentlemen, please welcome the circus! Each March the Ringling Bros. and Barnum & Bailey big top comes to the Big Apple, but the most unusual site to see is not one of the circus acts, but the informal "Elephant March". They lead the elephants through the Queens Midtown Tunnel and across 34th street to Madison Square Gardens the midnight before the opening night. The last time I gathered along 34th for the Elephant March was in 2007. 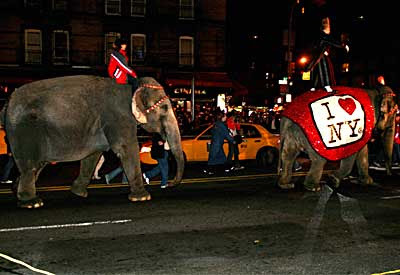 It was an extremely unusual and surreal site to see a line of pachyderms walking down the streets of Manhattan! This year the Elephant March is rumored to happen the night of March 23 (Monday night/Tuesday AM). Crowds will begin gathering along 34th street around 11pm. Often the elephants are late, slightly after midnight, but once they enter Manhattan they're surprisingly fast and you don't want to miss them.